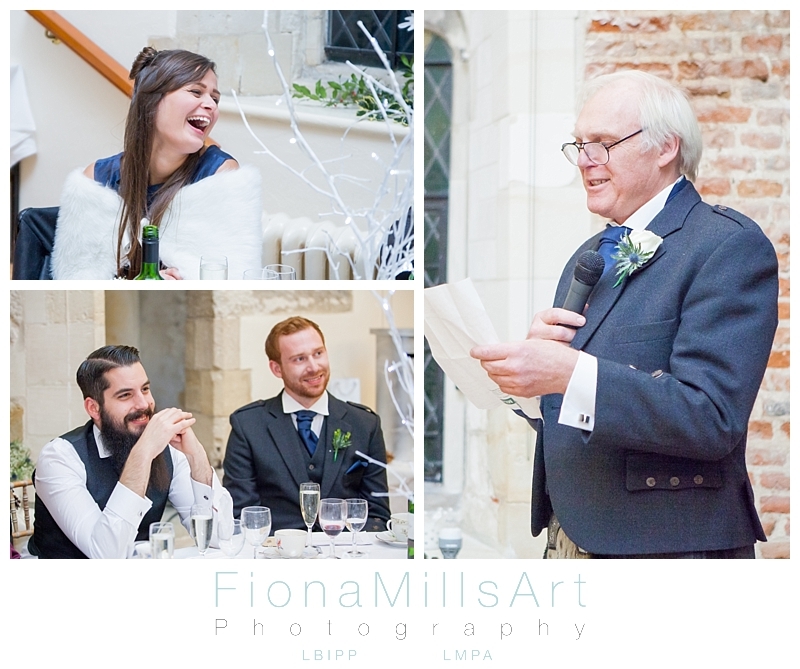 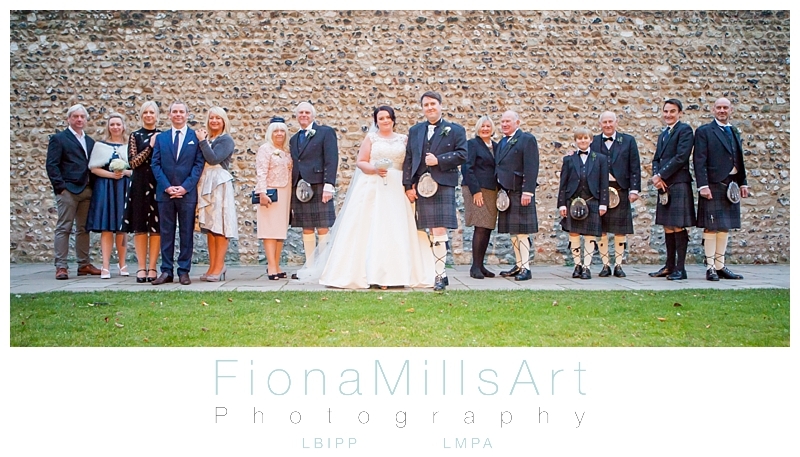 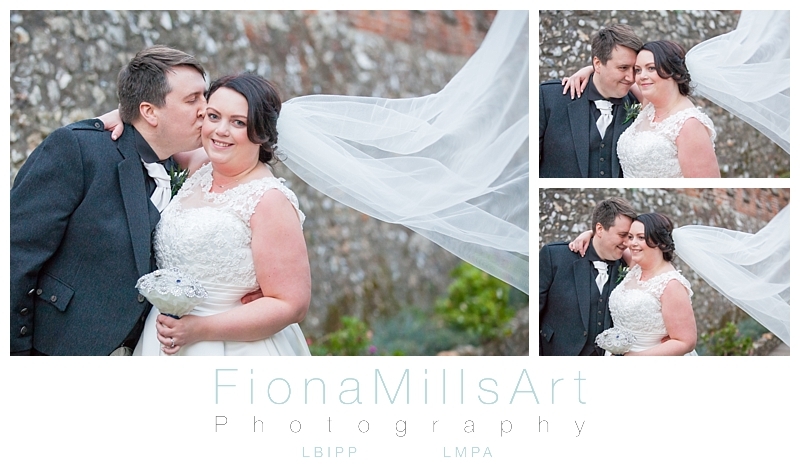 Lianne and Tom were planning a winter wonderland of a wedding in Chichester, West Sussex. 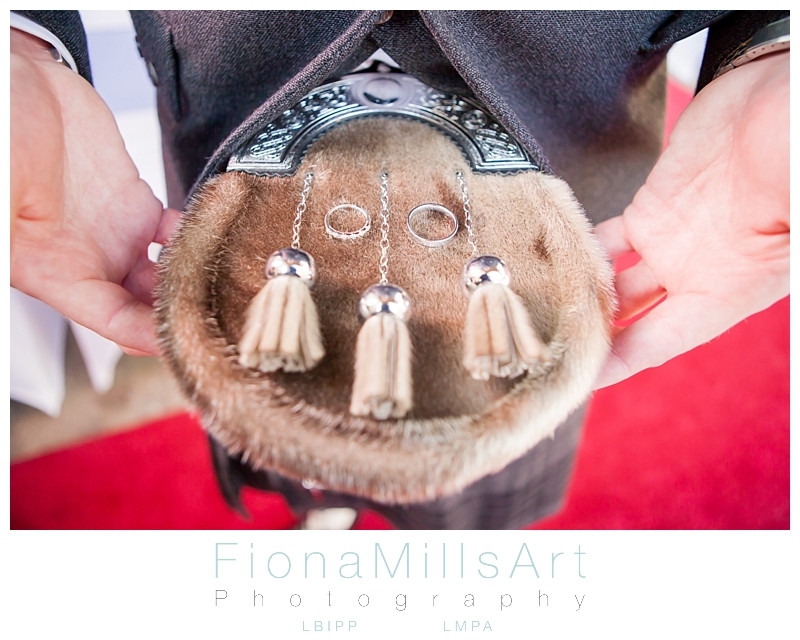 The theme was Narnia (which also happen to be one of my favourite collections of books!). 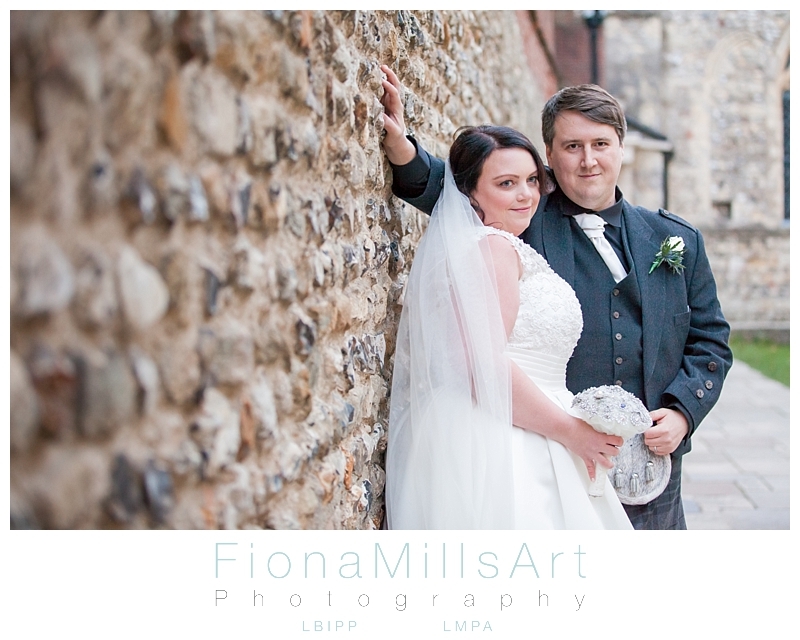 After spending the previous months getting to know each other over test shoots and planning sessions we were well under way for their wedding day. 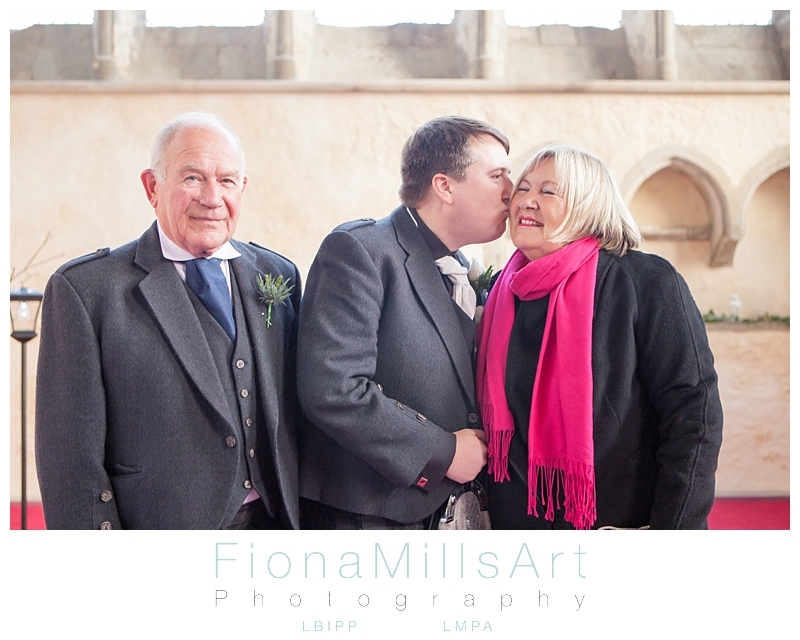 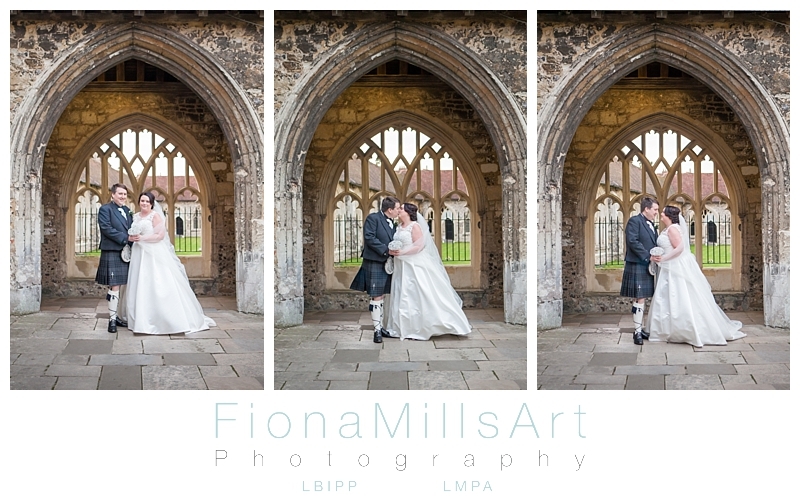 They had specific ideas when searching for their Chichester Wedding Photographer, so I’m very glad to have fit the bill. 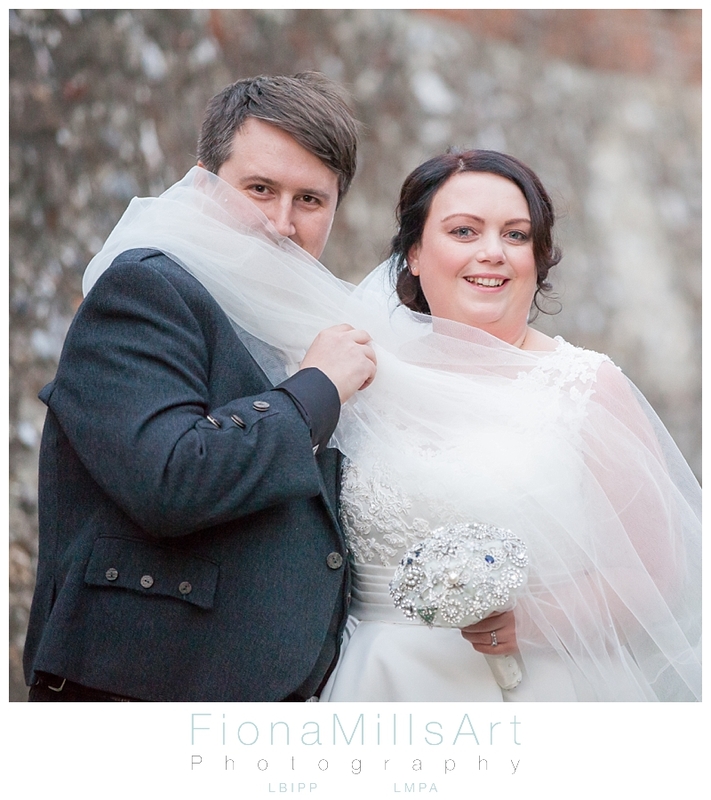 A creative couple, they wanted their day to be captured naturally and artistically while still representing the feel and vibe of the day. 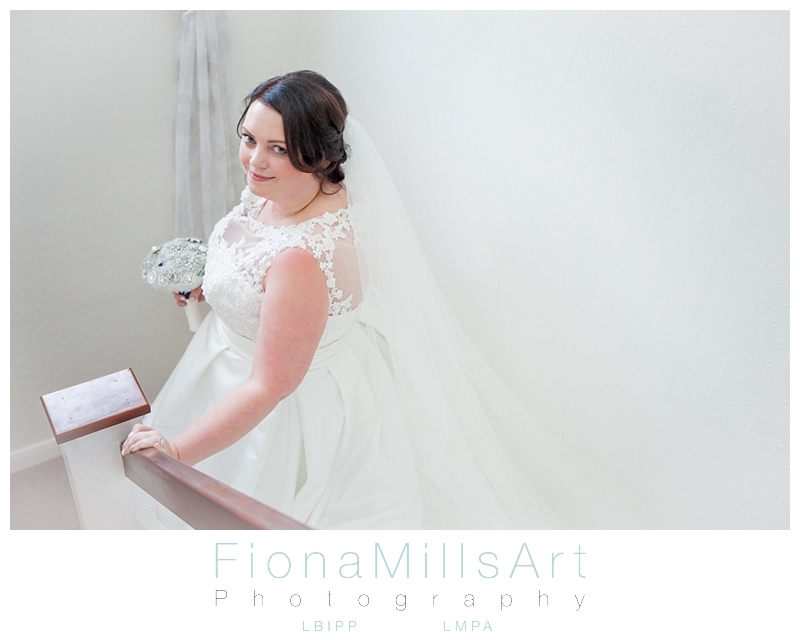 Lianne was getting ready at her parents house with some of her family and bridesmaids. 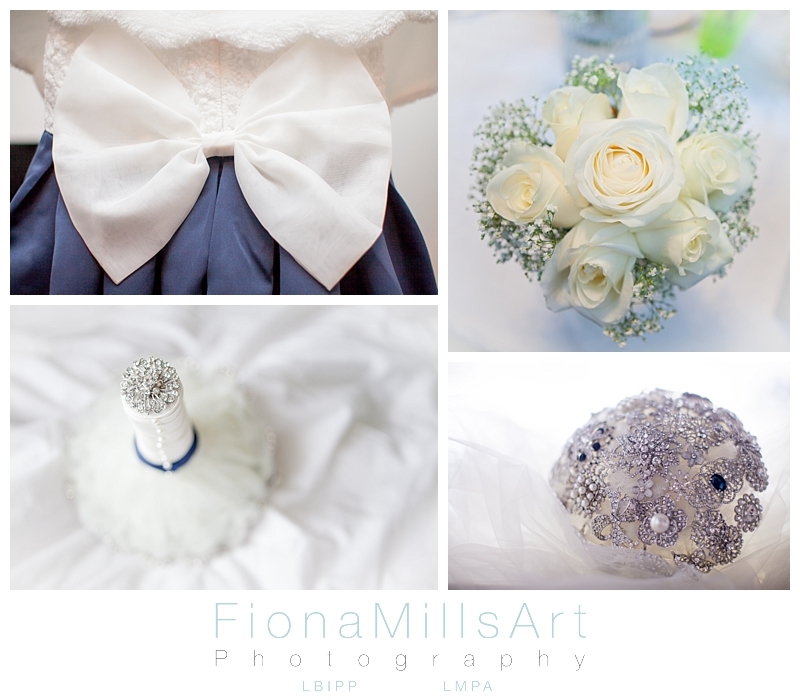 The creative apple doesn’t fall far from the tree it seems, as much of the decor and themed pieces were crafted and created by her mum, Sue. 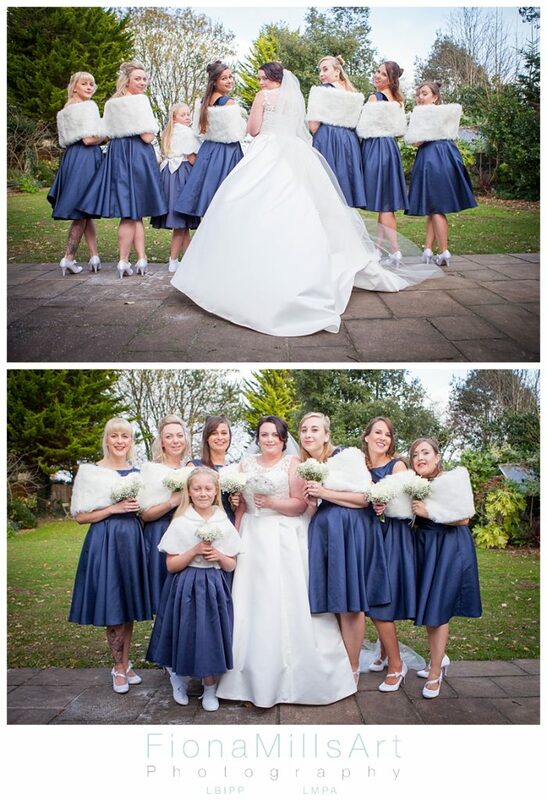 From the bridesmaids dresses in midnight blue, the fur stoles, the bridesmaids bouquets to the piece-de-resistance: The bridal bouquet. 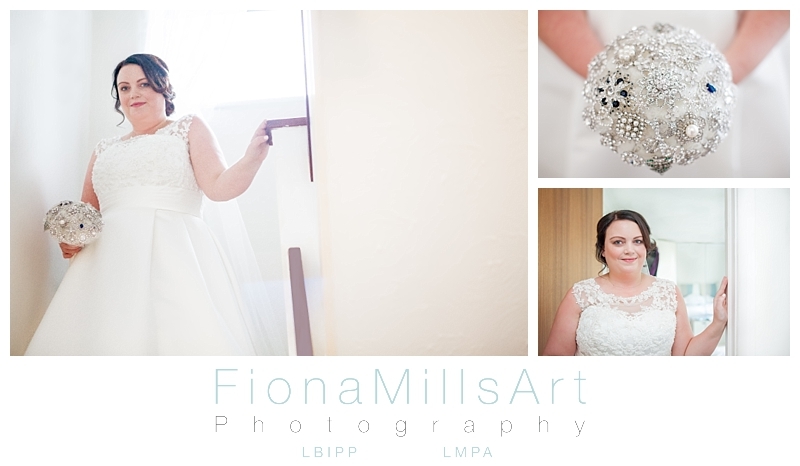 A stunning posey made with a selection of glittery brooches rather than flowers, it has to be one of the most unique bridal bouquets I’ve seen in a long time. 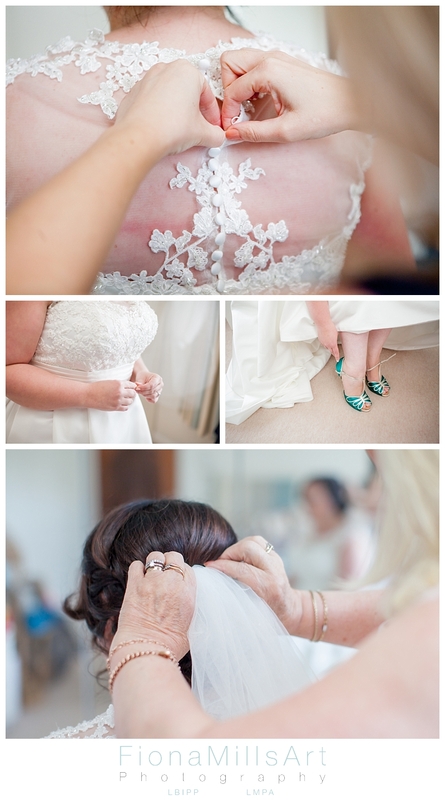 Much of the reception was also styled by Sue which you will see later. 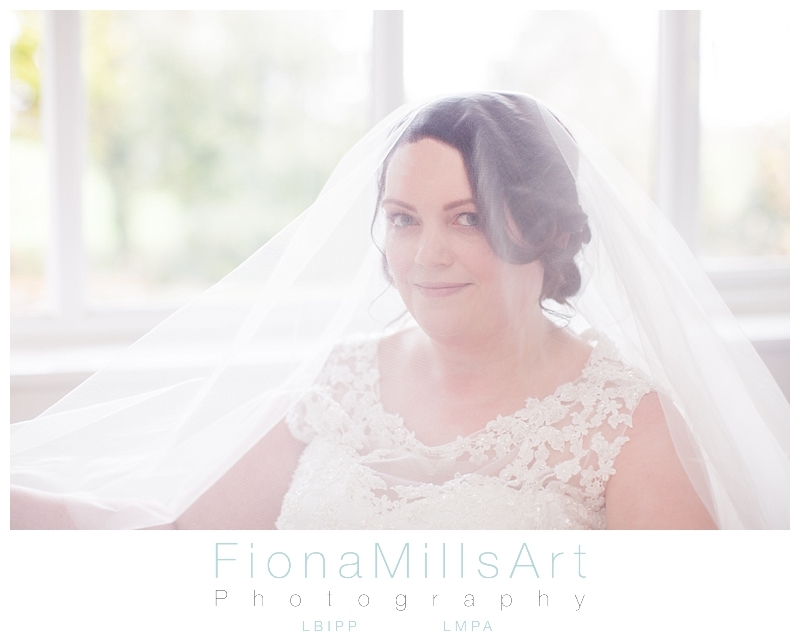 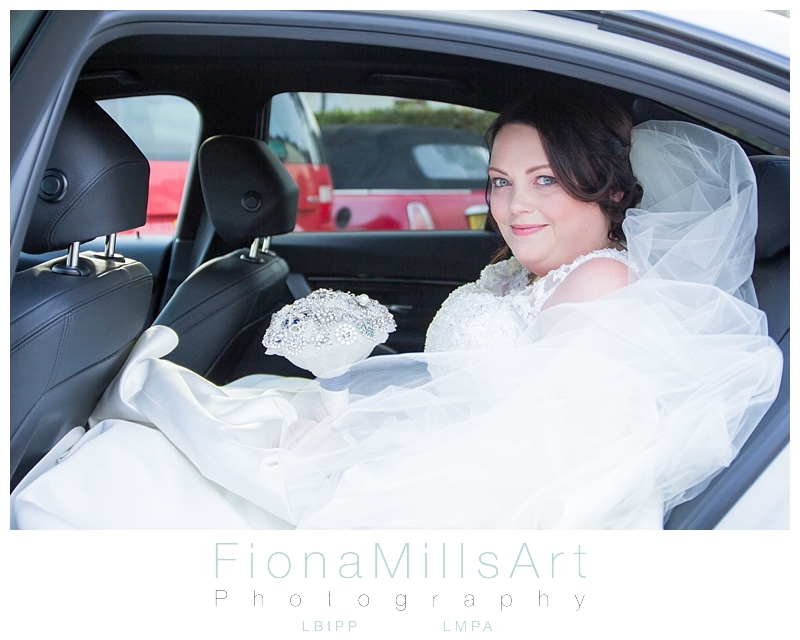 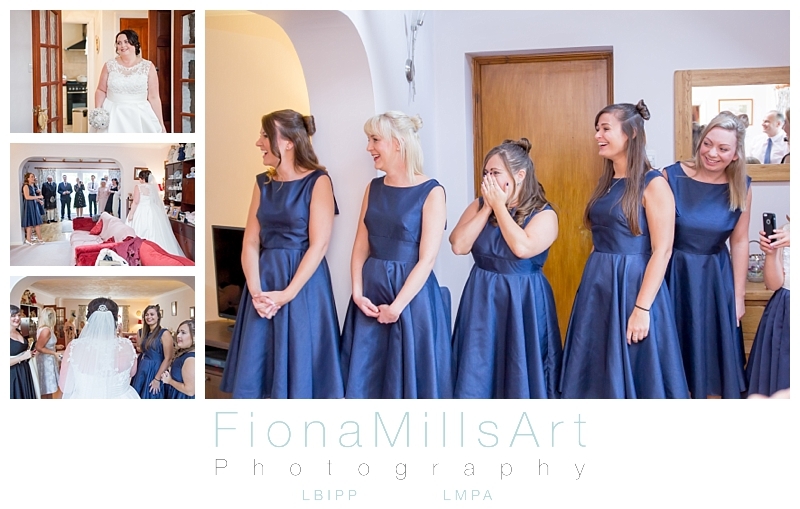 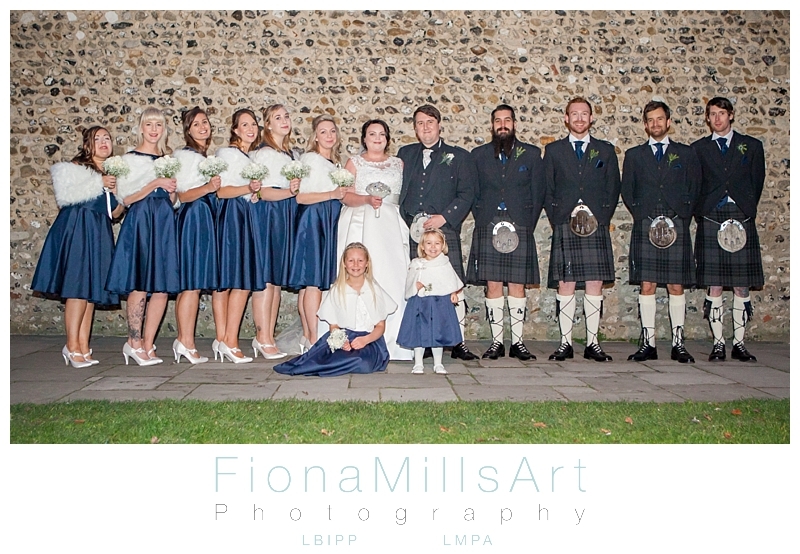 Wearing a stunning satin and lace gown, with porcelain skin, dark hair and striking blue eyes that shone with happiness, Lianne was the epitome of a beautiful bride. 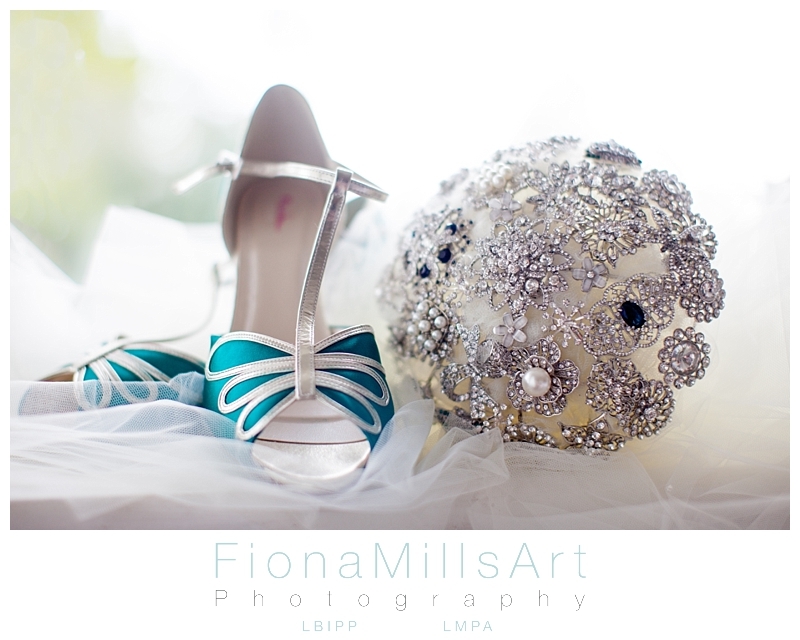 Finishing off her bride-style with some hand dyed teal shoes that peeped under her hem, she was ready to present herself to her awaiting family and friends. 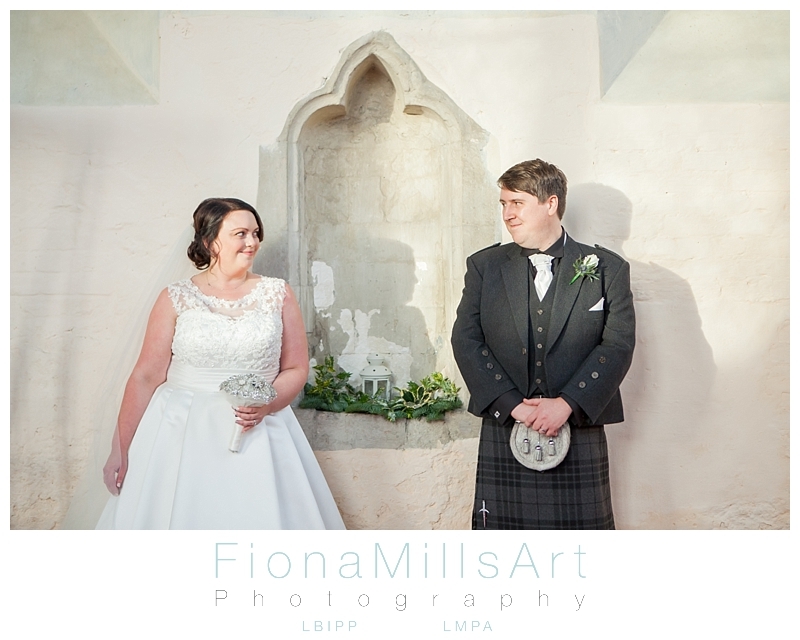 I love the emotion in their faces as they see the bride for the first time. 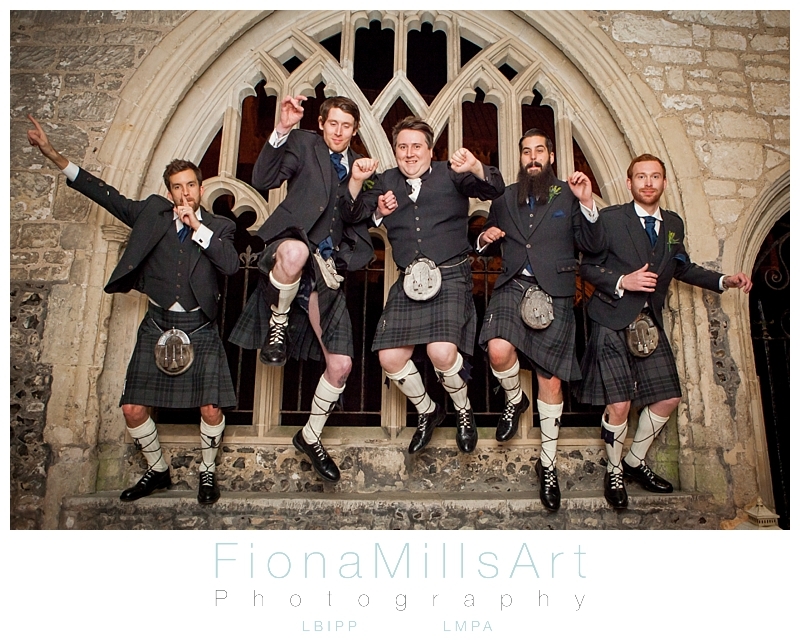 While the bridal party finished up at home, Lee and I arrived at the Guildhall in Priory Park to capture the Groom, Tom and his Best Men. 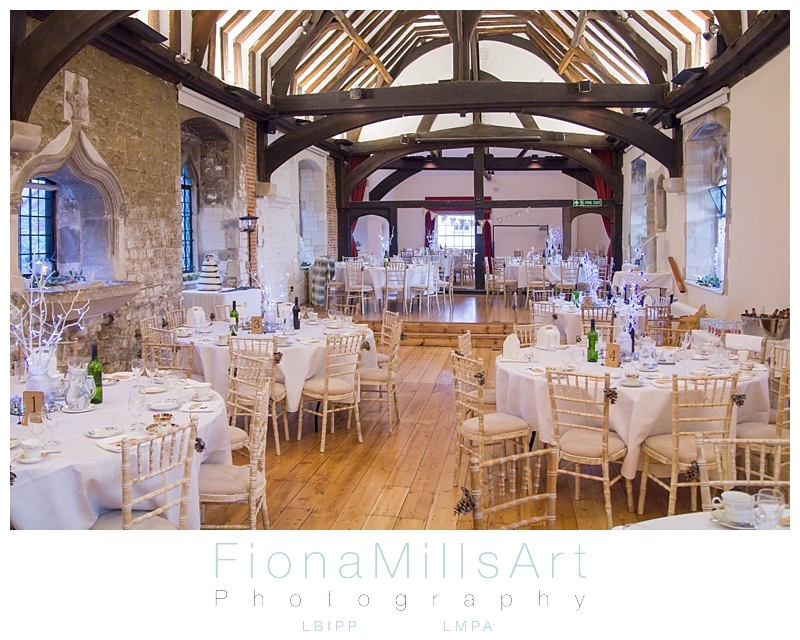 Recently re-opened as a wedding venue, the Guildhall is a fabulous piece of Chichester architecture. 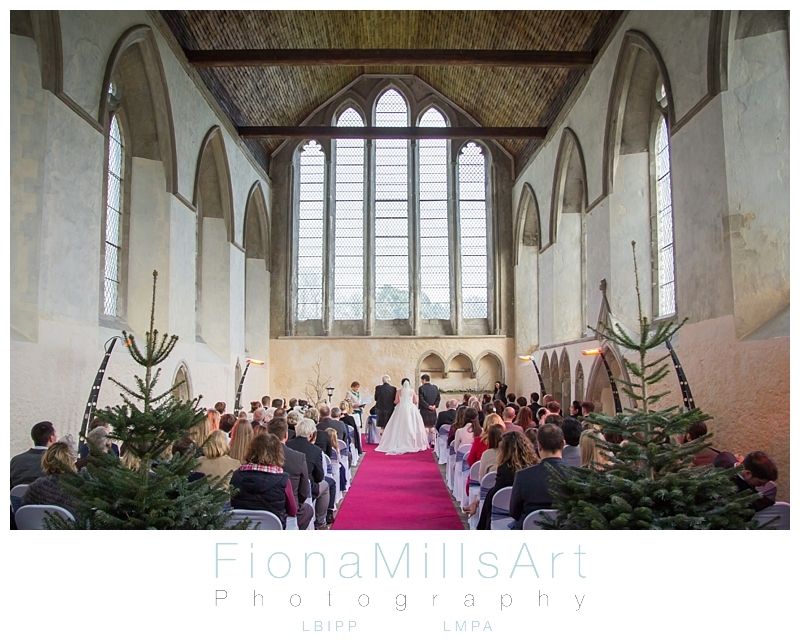 Bright, spacious and expansive, with it’s tall ceilings and gothic windows, light just streams in. 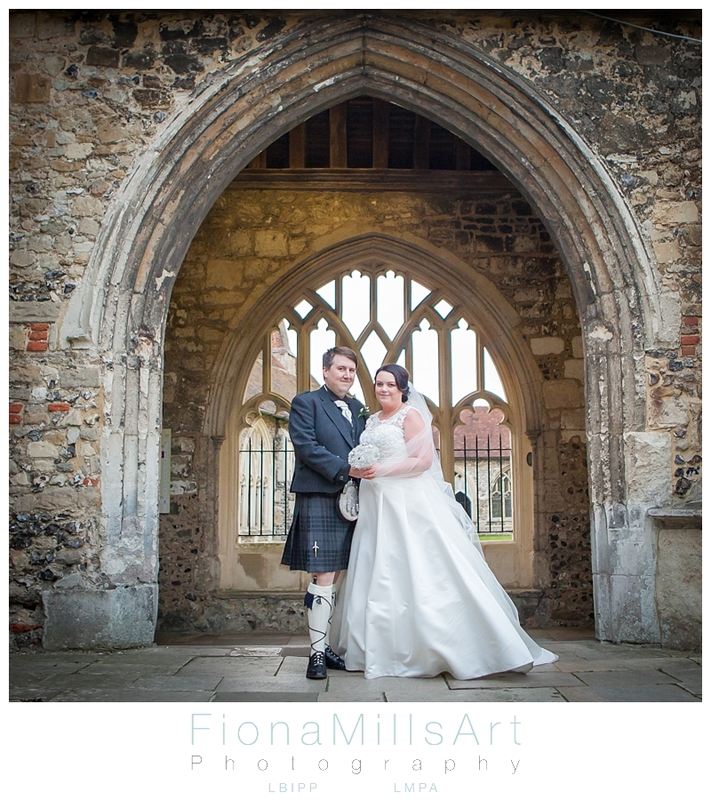 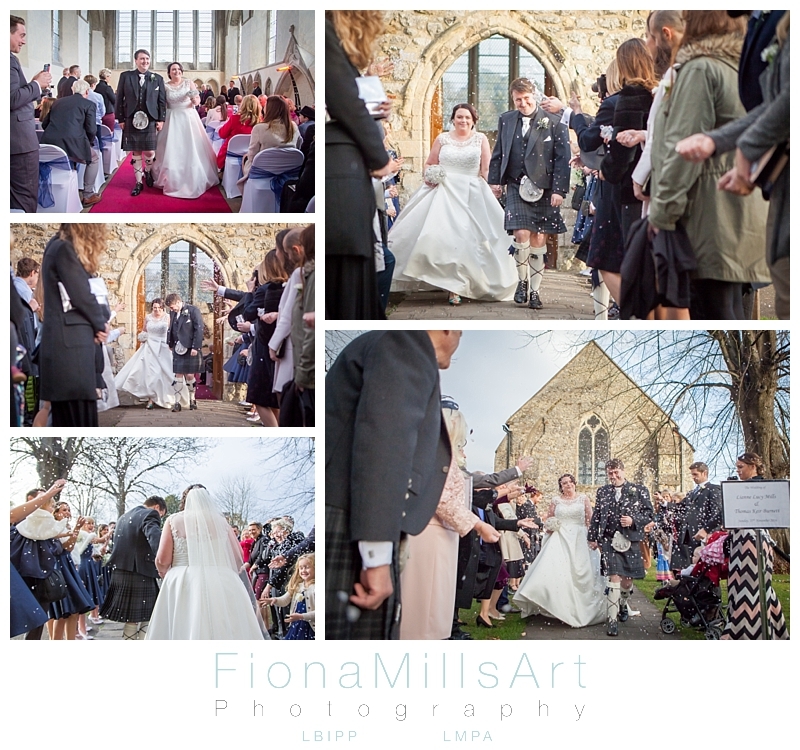 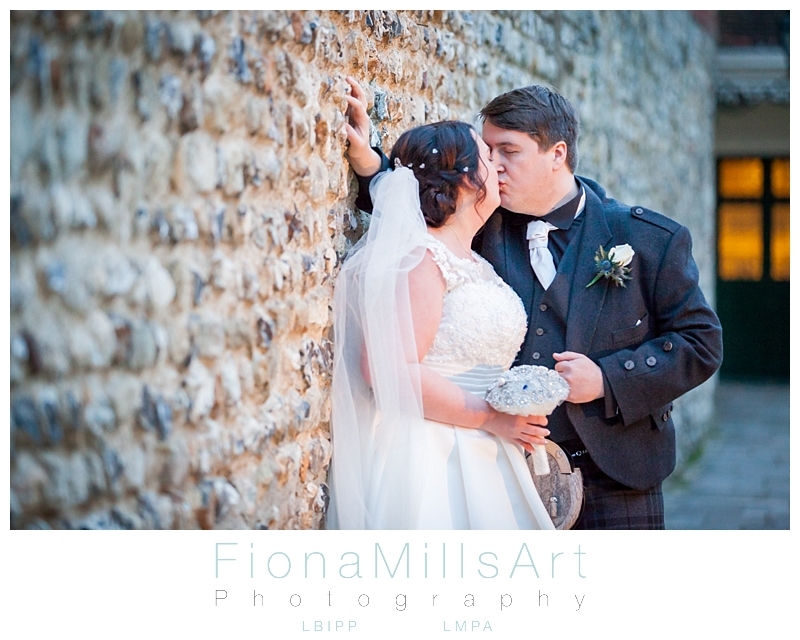 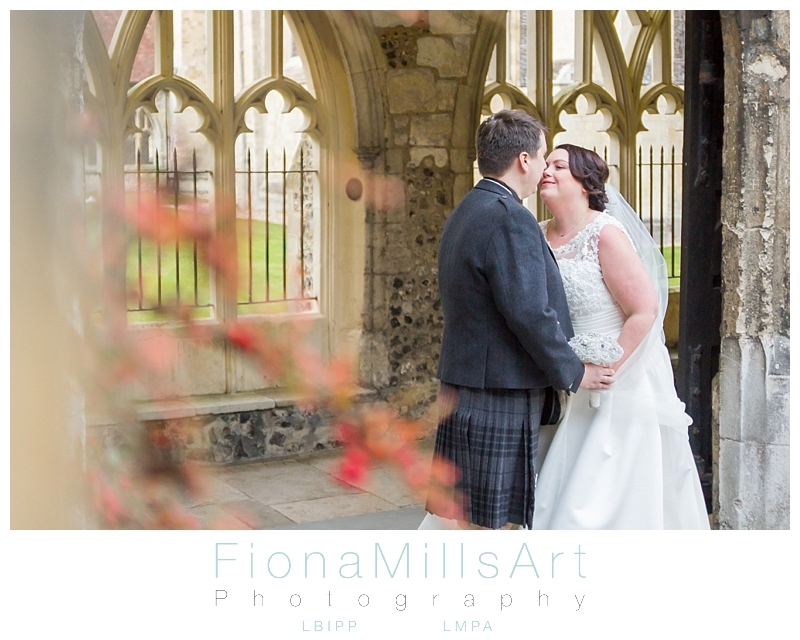 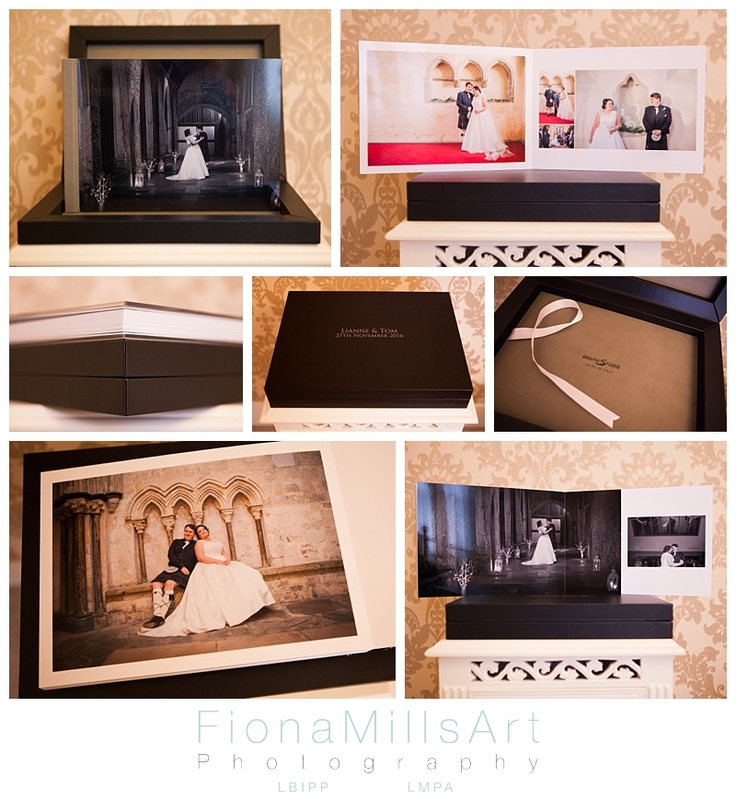 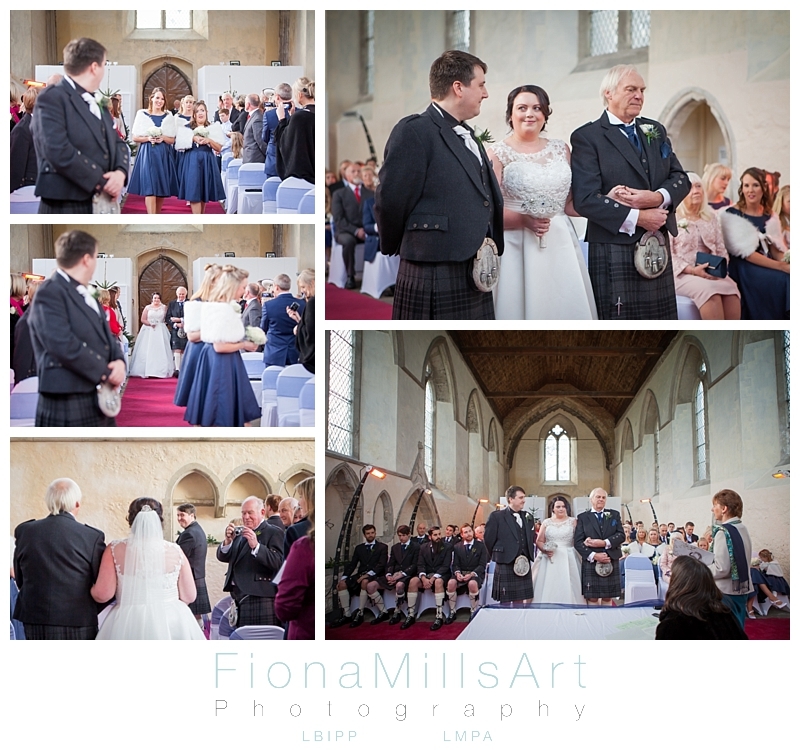 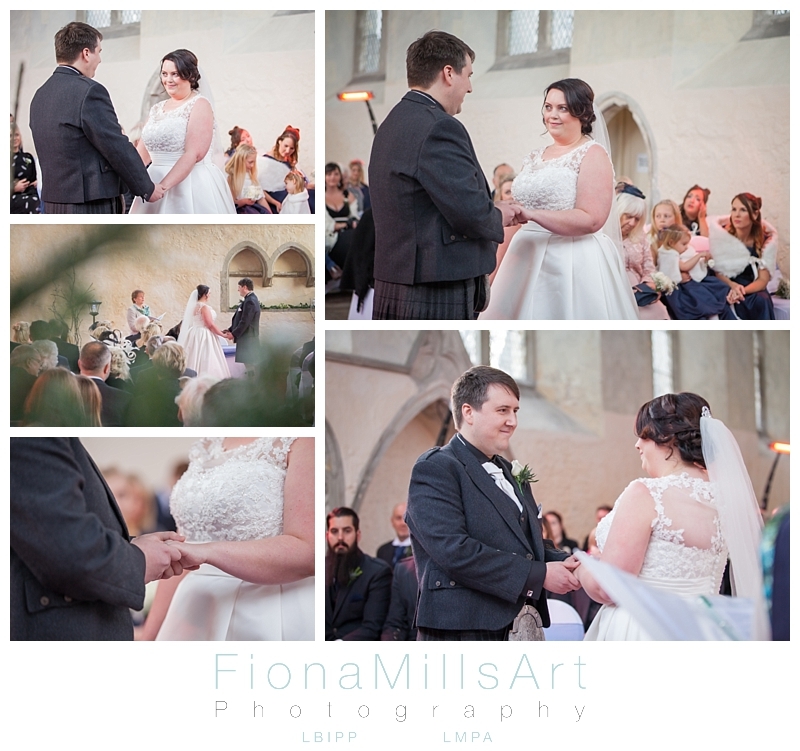 The building retains much of its original features and character, and set in the City Centre within Priory Park it just cries out for weddings, as a Chichester Wedding Photographer I am so glad it has reopened! 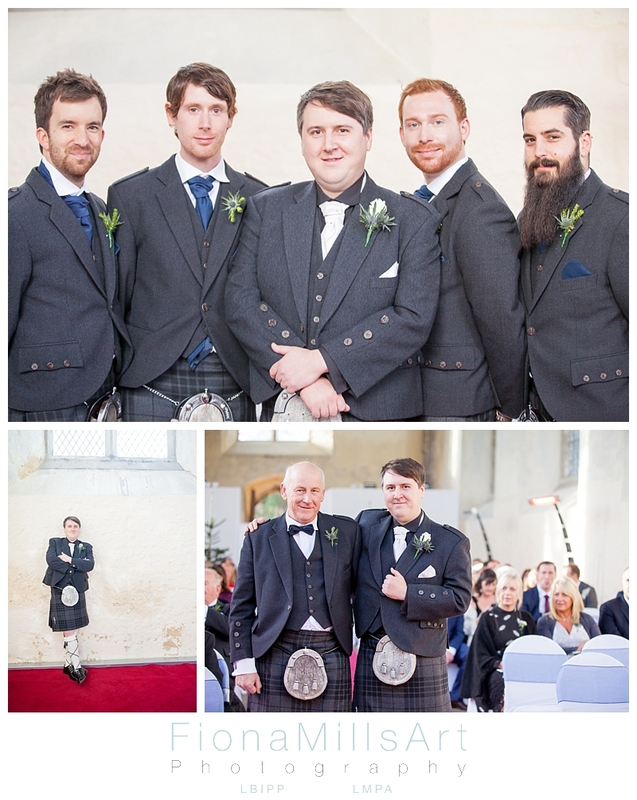 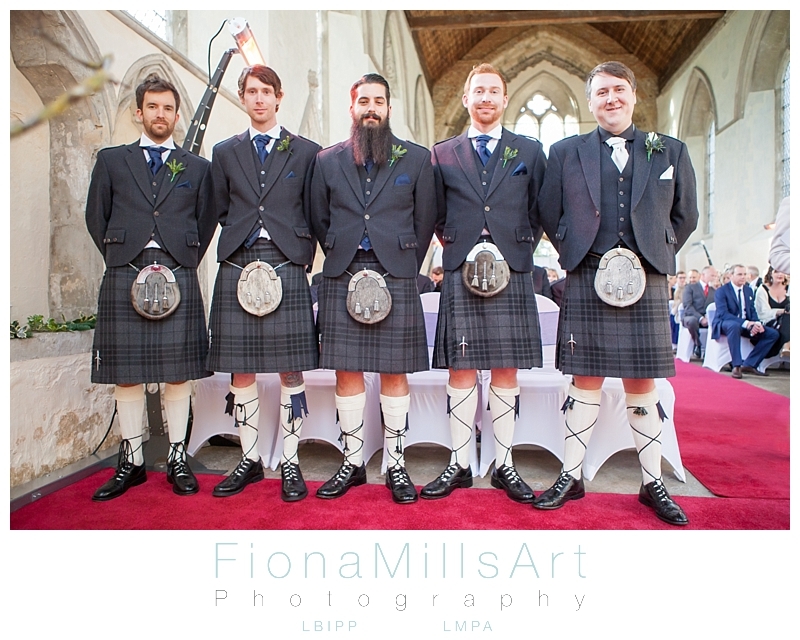 Tom and his groomsmen were dressed in the finest Scottish attire, complete with sporran and Sgian Dubh’s in their long socks. 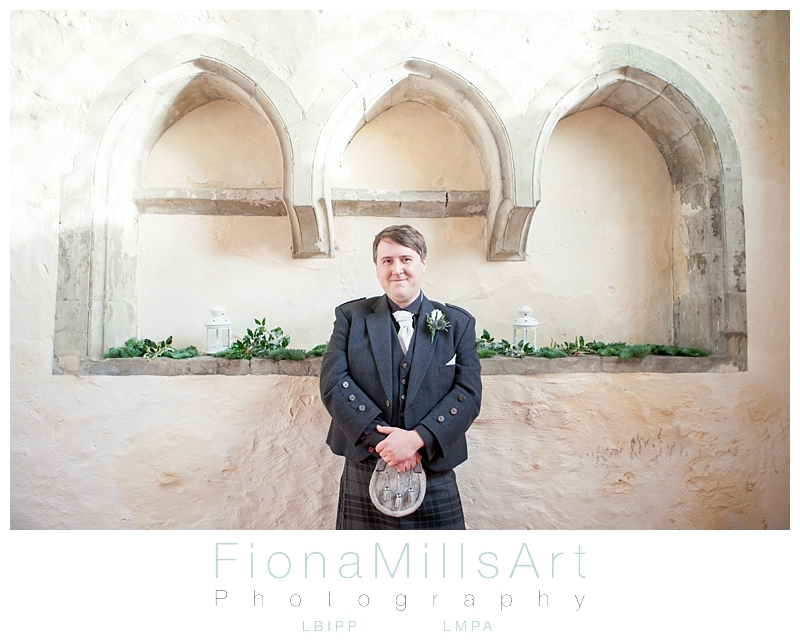 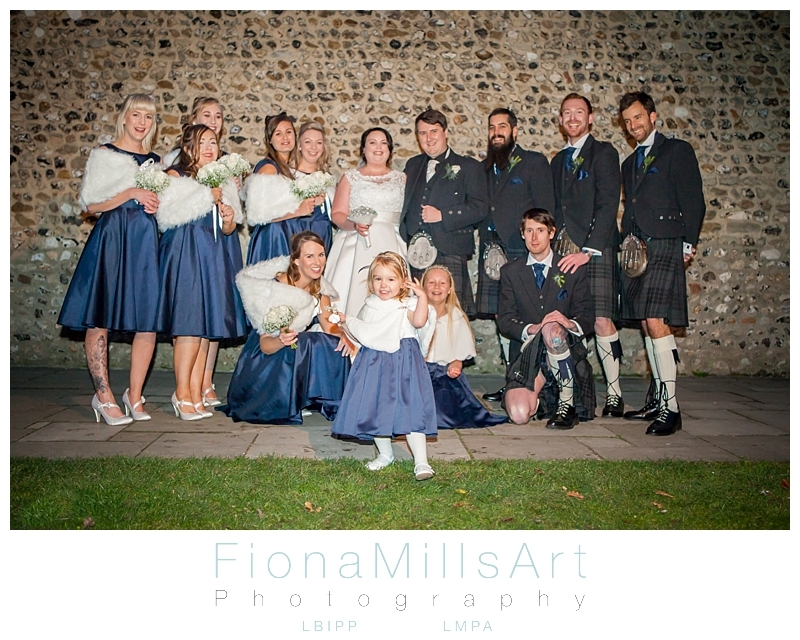 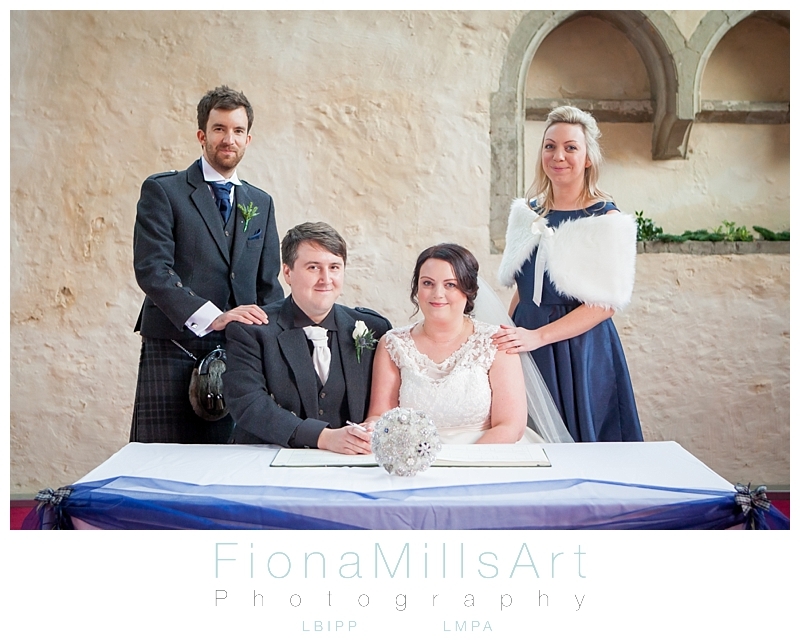 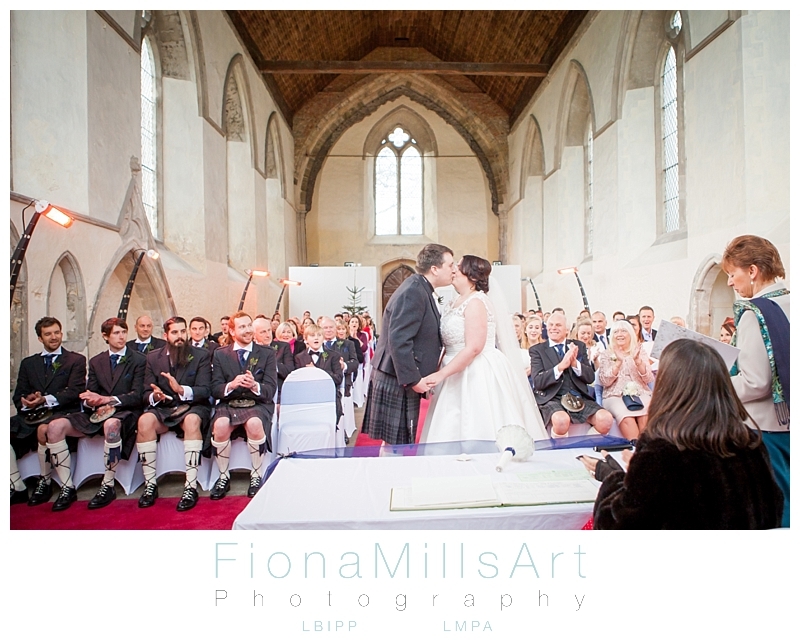 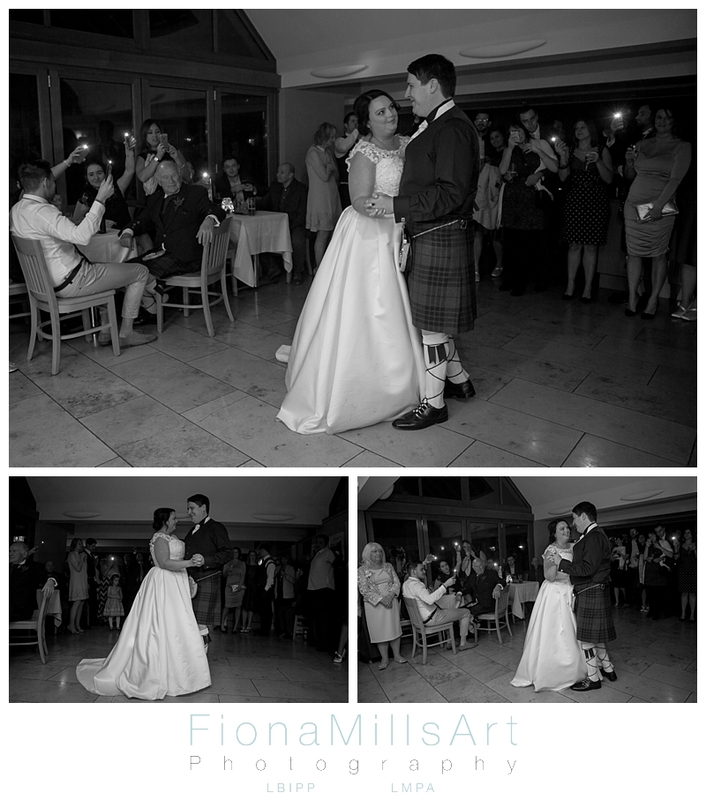 As you can see while the couple marry, some celebrate with a photo-op, others with a wee dram! 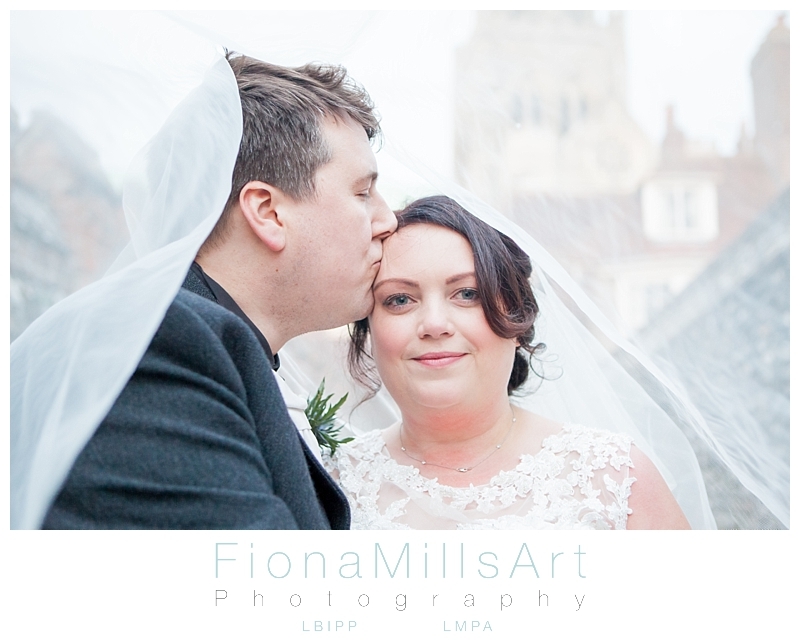 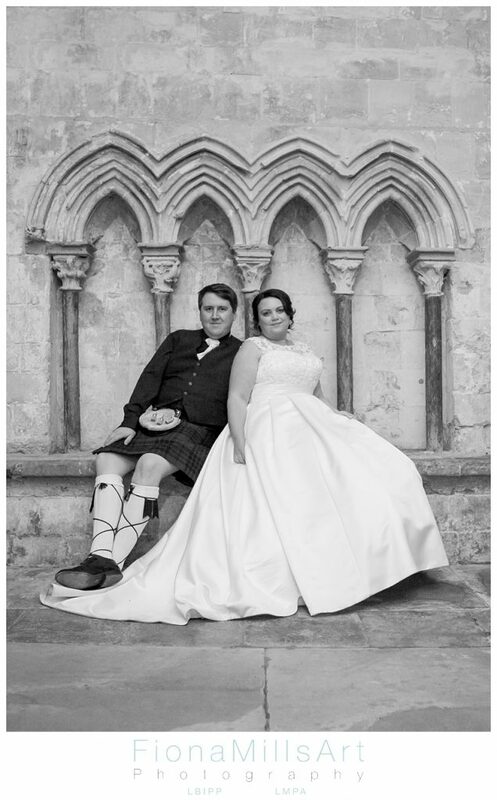 The newlyweds had planned their reception at Vicars Hall at Chichester Cathedral. 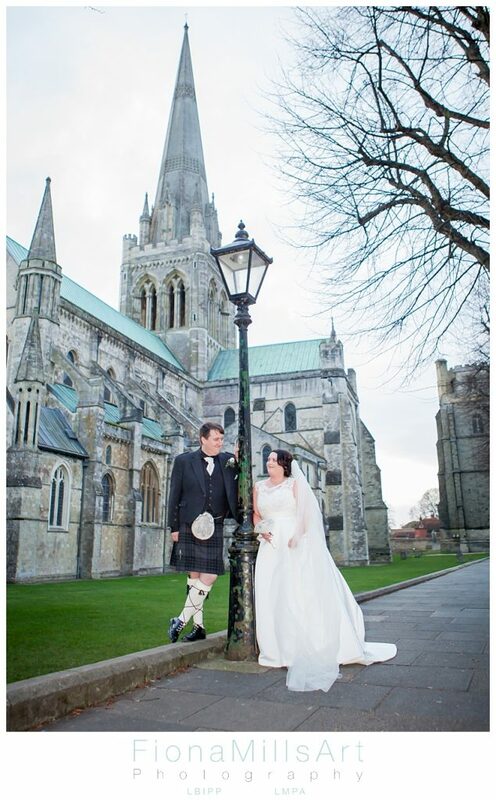 We spent a short time on portraits (including one with a lamppost in homage to Narnia) before they stopped for an afternoon tea. 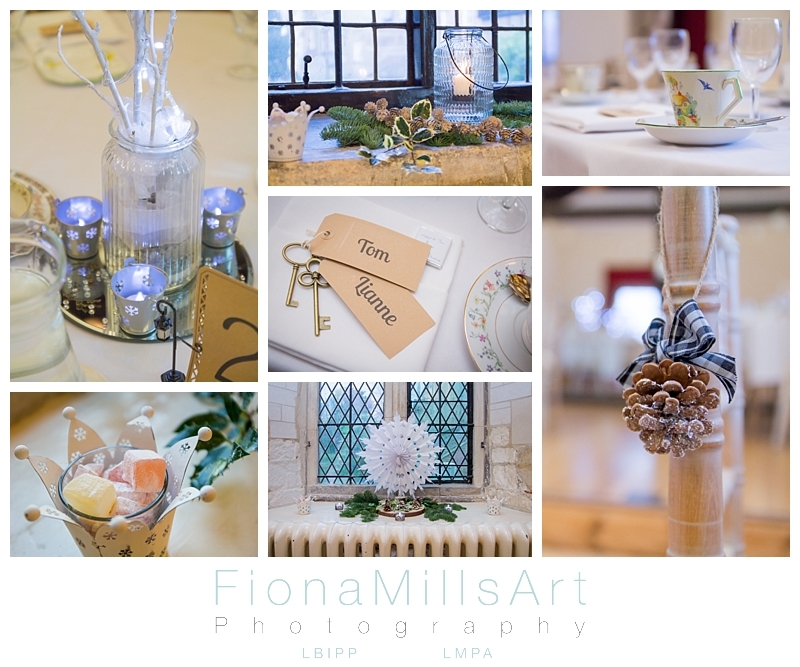 The room was tastefully decorated with winter white twigs and fairy lights, pine cones, lampposts and keys with turkish delight on the table and vintage tea sets ready to warm the guests as they arrived. 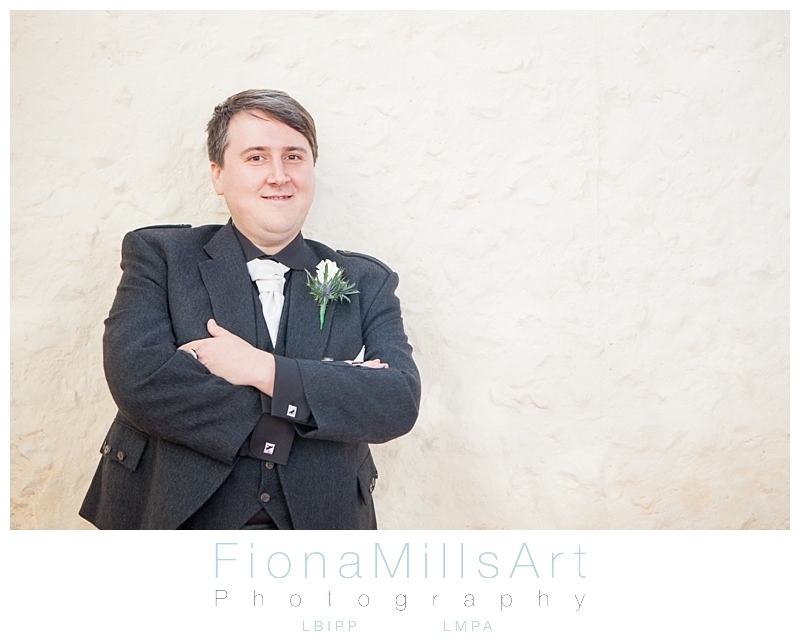 A Star Wars fan, Tom managed to sneak in his own spin…. 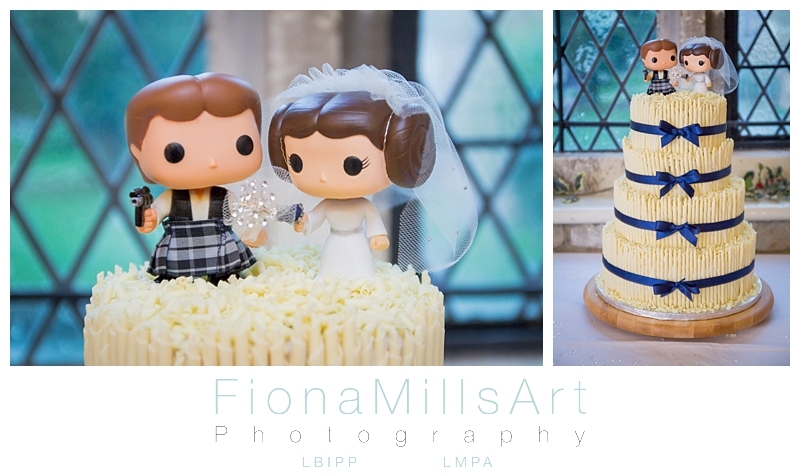 a Princess Leah and Hans Solo bobble head couple, dressed in outfits to match Lianne and Tom and set as the cake toppers. 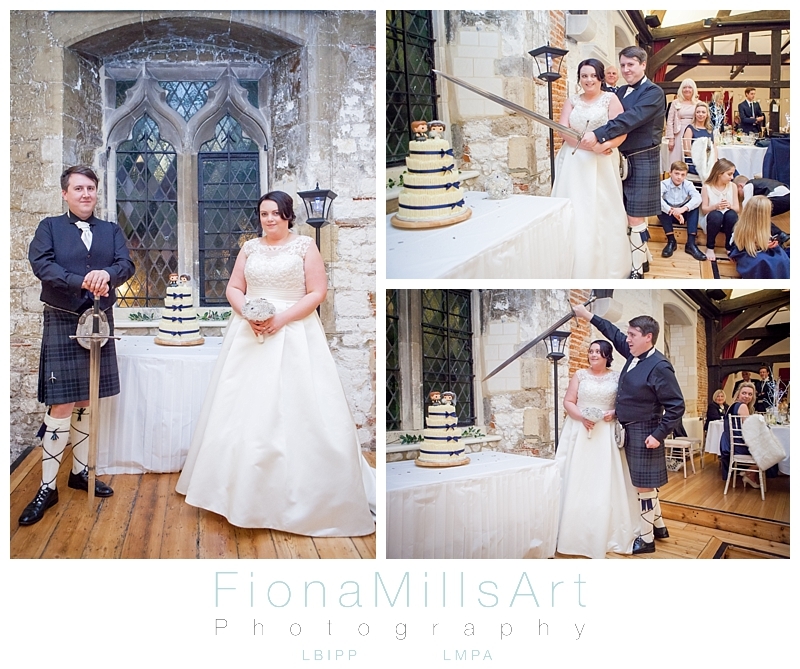 As you can see, they bravely bobbled to attention as Tom and Lianne prepared to cut their cake with a Scottish long sword. 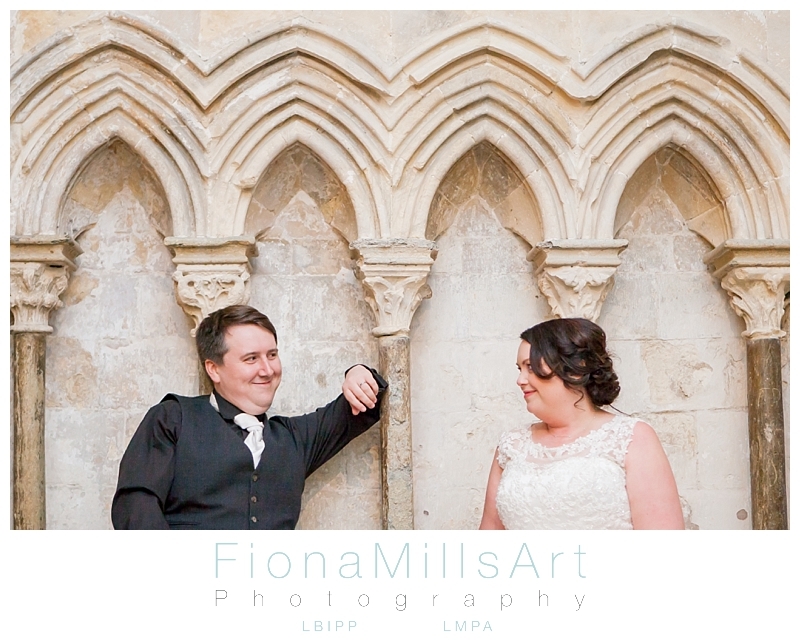 The party was set in the Cloisters with a DJ and BBQ. 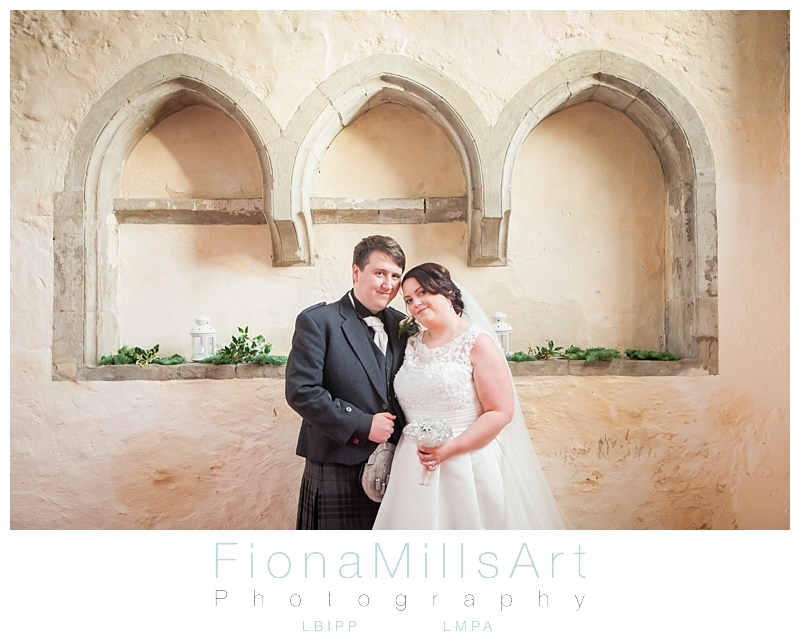 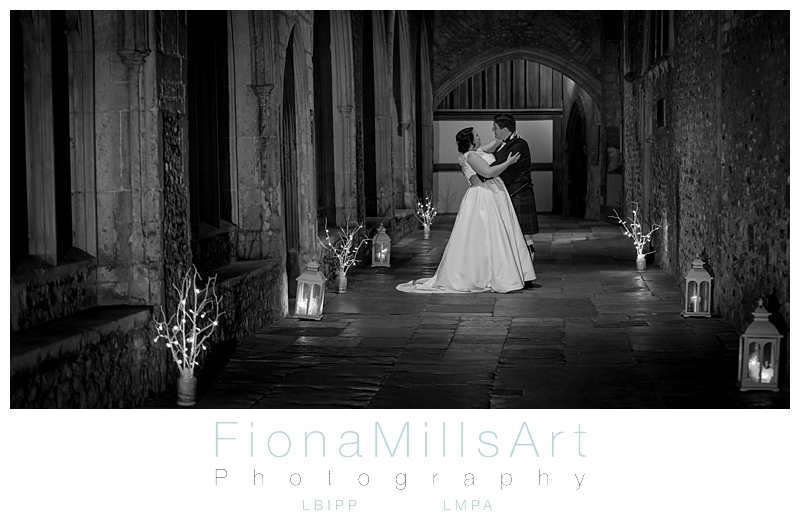 Before Lee and I left them to their party, we made the most of the dark cloisters for a few more portraits. 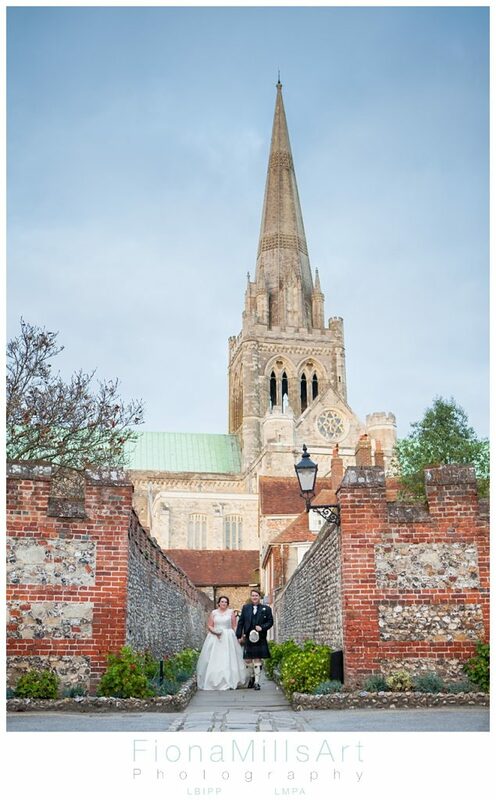 I just love the lines and curves of the building, in awe of how vast and precisely these cathedrals were built so many years ago. 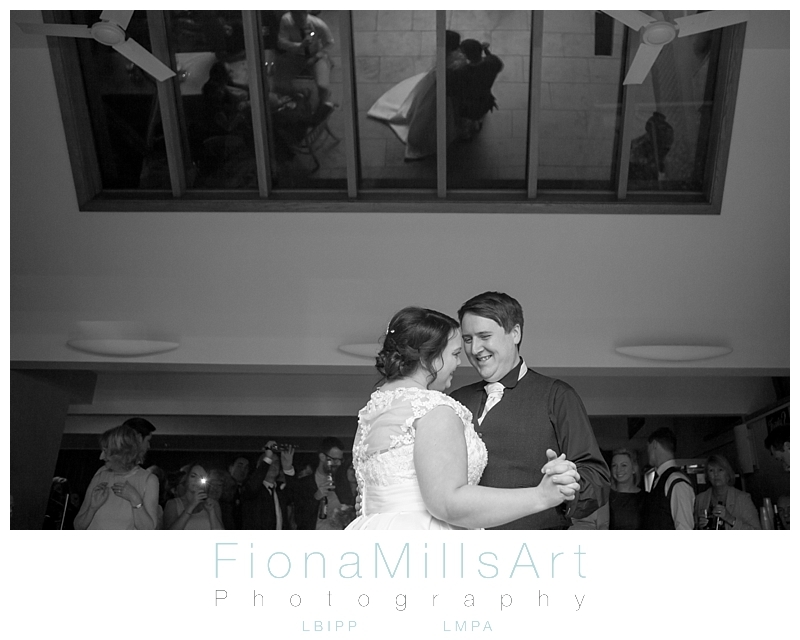 The final act to Lianne and Tom’s wedding day is the Graphistudio Album. 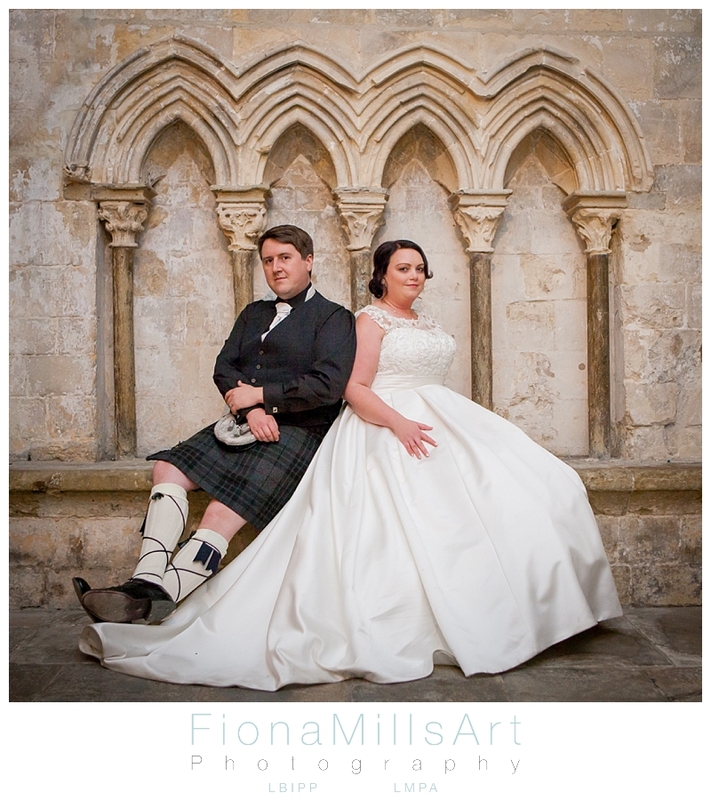 They chose a Young Book with a Crystal Glance cover to really show off that dramatic shot in the cloisters. 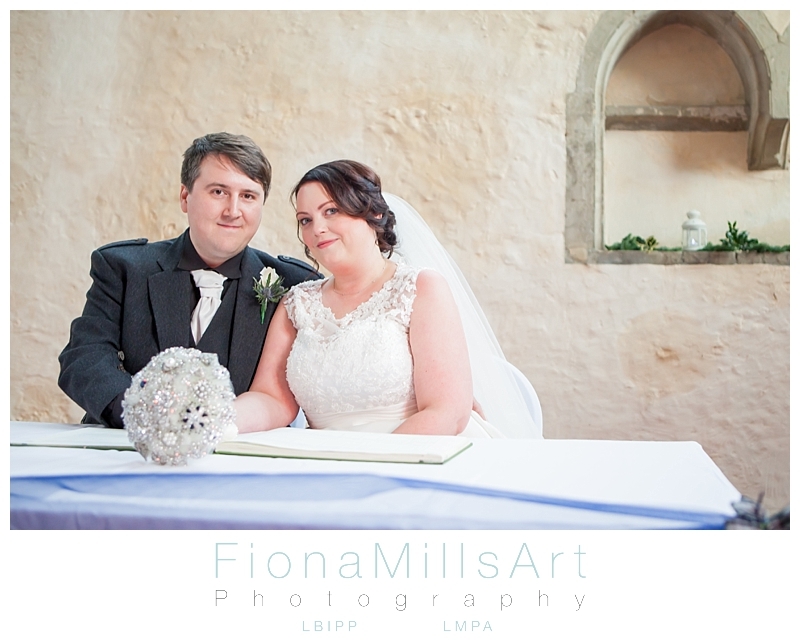 Congratulations Mr & Mrs Burnett it has been most lovely meeting you and capturing your amazing day!